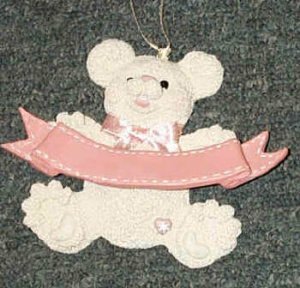 Resin Snowbearie Pink Ornament; 4" White resin snowbearie ornament with a pink ribbon that can be personalized. We can put "It's a Girl", the childs name & date, etc. There is also a pink bow around..
Resin Snowbearie Pink Ornament; 4" White resin snowbearie ornament with a pink ribbon that can be personalized. We can put "It's a Girl", the childs name & date, etc. There is also a pink bow around her neck and a small pink heart by her left foot. Great for a baby shower gift or present for a newborn.